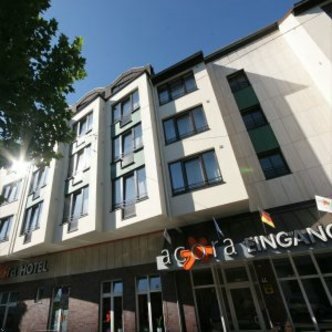 The DERAG Hotel acora Bochum is a 3 star superior hotel located in the city centre of Bochum. The hotel with its 216 spacious comfortable rooms and apartments combines the traditional hotel with the idea of independent living. Business travellers - especially long time guests - have discovered this way of travel and this kind of hotel living with full arranged kitchenettes in the bulk of our ample rooms. Choose between a hotel room, fully equipped apartments up to spacious studios. For our long stay guests we offer laundry facilities with washing machines and driers. For your recreation you find a fitness centre with solarium and work out machines. In the evening the restaurant Faessle offers local specialities and classic international cuisine - freshly prepared and delicious. Later at night guests can meet with friends to enjoy a drink and talk at our hotel bar. Our conference guests find 3 modern equipped and air-conditioned meeting rooms. For all guests arriving by car our hotel garage is at your disposal.